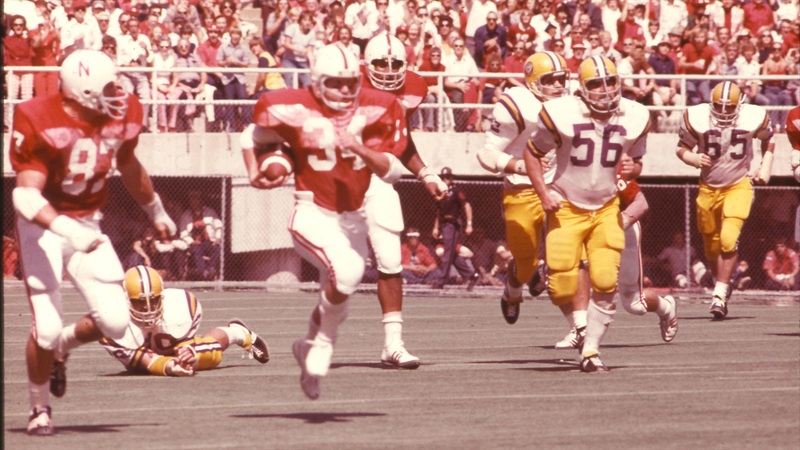 Nebraska and LSU have met six times on a football field -- four times in bowls, once in Lincoln in 1975 (above) and once in Baton Rouge a year later (a 6-6 tie). The Huskers lead the series 5-0-1, but the two proud programs haven't played each other since the 1987 Sugar Bowl. Lately, however, the purple-and-gold and scarlet-and-cream have mixed a little bit. Former Tigers head coach Les Miles notably donned a Huskers hat on ESPN2 on signing day to celebrate his son, Ben, signing with Nebraska in the 2017 class. Miles, who continues to say he wants to coach again, seems to get asked about Nebraska often on the interview circuit. "The interesting piece was, I was dad. I can remember, just for years, when I walked into a living room, I said listen, this dad's going to step in a make a decision, or this mom's going to step in and make a decision," he said. "And heck with it, right? "And suddenly, it's your son," he said. "And you realize he's really earned the right. He's made great decisions his whole career. And he's grown up right. You know what? He wants to go to Nebraska, and I'm for him. "It's a much different position than the head coach. The head coach sees his roster, and he wants to manage his team ... all this ... improvement of a team. But your son. You want him to be with good people. Yea, I was in support of the choice. I was a very proud poppa." Assuming Les isn't taking a coaching gig for the 2017 season, I suspect you'll see him around the Huskers a couple of times this fall. Joseph, a former Archbishop Shaw star and Nebraska quarterback, may land his first major college job. He has coached receivers, quarterbacks and special teams at various smaller colleges and historically black schools, including Grambling (2014-15), Alcorn State (2013), Central Oklahoma (2004), Nicholls State (2001-03), Alabama State (2000) and Tulane (1999). He replaced (current LSU staffer Jabbar) Juluke at Louisiana Tech last year. LSU fans appear less convinced of the potential hire, but as someone with no rooting interest here I think it's important to close this cultural-exchange circle so I officially endorse Mickey Joseph for LSU. Nebraska ranked 24th in Land of 10's early top 40 for 2017. Some Pac-12 ADs are unhappy with their payouts from the Pac-12 Network. Rudy's Notre Dame helmet and jersey recently sold for $241,500.